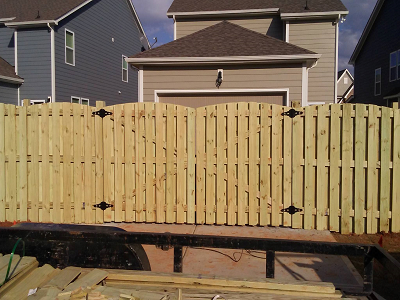 Buying a Smithfield wood fence is most popular type of fencing , A Smithfield NC wood fence is the 6-foot privacy wood fence, The 6 foot Privacy wood fence will cost around 12 to 15 dollars a foot all depending on the thickness of the dog ear pickets. Wood Fence Pickets come in the sizes of 5/8 or 3/4 inch thick. a wood fence gives you the best in both security and privacy. It offers the strength and durability you are looking for all while creating your yard with a simple privacy look with elegance at the same time. Wooden fences usually last around 5 to 10 years but only if you take care of it by staining it or putting some kind of treatment on it. Most people would rather stain the fence than paint it due to the time and cost of scarping the old paint off and repainting your wood fence. If you decide to paint your wood fence make sure you prime it first as the paint will just soak in the wood. Wood fences already come with a treatment but to ensure the fence keeps the new look we recommend staining it within the first year as when the wood is treated from the factory then shipped to other outlets for resale, sometimes the wood sits in the yard for 6 months and as the sun beats on it dampening the treatment it seems to dry out. Remember all wood fences will wind up warping if not taken care of properly. Treat your wood fence as if you was going to lay on the beach and protect yourself from the sun as it will dry you out and make your skin crack and peal, So putting on sun screen is the same as putting on a wood stain protectant. Be kind to your new wood fence. 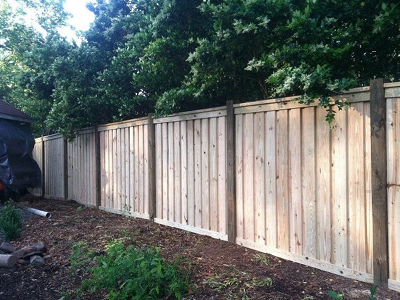 We offer a variety of designs in Smithfield Wood Fence, to residences of 4 foot tall to 6 foot tall throughout Smithfield and the Triangle area. We handle old and new wood fencing projects and repairs. We work with you to design to ensure that it gives you the look you need depending on your HOA requirements. Some HOA have restrictions and can make your wood fence only one style to choose from. We can do an arch cut or inverted arch cut or just give you the 6 foot wood privacy fence. We use 4x6 or 6x6 treated for your gate post as they take and carry most of the beating going in and out all the time, and sometimes kids will slam the gate and cause it to not function properly. The wood gate can be made as a 3, 4 foot or 5 foot width opening. The wood gates come with heavy duty black gate hardware, hinges and latch. Smithfield Fence Contractor NC Wood fences are economical option for everyone, choose from designs including picket patterns, and more. Pick your style of wood fence caps to get the look you want . You can order special design wood fence caps if you want to show off the new fence, some even come with solar lights so even at night your new wood fence will standout for all to see. Hiring a wood fence contractor can be somewhat aggravating as most bigger companies charge you allot more than your local small company, Keep in mind when you buy a Smithfield Wood Fence to be installed make sure you know what grade of wood you are getting and that it has not dried out causing you to have to satin it sooner than normal. The bigger fence companies will charge you almost 18 to 20 dollars a foot causing you to have to finance with them, At Daniels Fencing, we want to make sure your first fence project is the best. So if you want to save money on your new wood fence and not have to finance and pay a bunch of interest on top of it Call Daniel’s Fencing Today 919-812-7287 to get your wood fence project done. Remember we are a small Smithfield Wood Fencing Contractor business who wants to help keep your fence cost down on your new wood fence project. Compared to most big fence companies we Smithfield Wood Fences can save you around 500 to 700 depending on the fence material. So Call Daniel’s Fencing Today 919-812-7287 to get your Smithfield Fence Estimate NC. wood fence project done without the overwhelming cost and feel better knowing you saved money and got the same type of fence done as other companies. 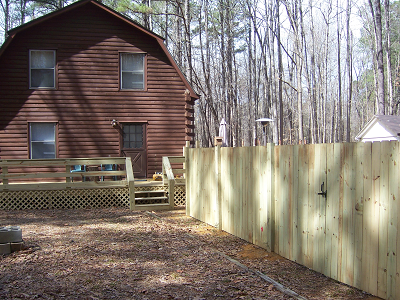 Smithfield NC Wood Fence Company since 1998. Get you Smithfield Wood Fence Installations today and save. Where to dispose of old wooden fence in your area. Please do not burn old wooden fence material as it is against the law and bad for the ozone. Check with your local city landfill and make sure you cut it down so that it can be destroyed properly. Make sure you tell them you are a home owner and not a contractor. You can see how it is affecting us Below.